Chris Martin surprised a fan with cancer in the Philippines after his illness meant he could not attend a Coldplay gig he had a ticket for. Led Zeppelin are heading for trial over their 1971 hit Stairway to Heaven, here are five other songs which also ended up in court. Stars will entertain an audience of more than 100 million as they take to the Super Bowl half-time stage. Ed Sheeran has seen off competition from Coldplay to claim the year's best-selling album. The Duke of Cambridge revealed he is a fan of British rockers Coldplay, during a visit to a school in East Yorkshire today. When William was asked by pupils at Goole High School what music he liked, the Duke was heard to reply: "I really like Coldplay, Linkin Park." He turned down an offer by pupils who are part of the school's samba band to play one of the drums, telling them: "I used to play the piano, trumpet and drums when I was your age but I couldn't read music. "There's only so much you can remember from the top of your head." Visit ITV News Calendar for more on this story. Hollywood actress Gwyneth Paltrow and Coldplay frontman Chris Martin have split after nearly 11 years of marriage, they have announced. The online post was entitled "Conscious Uncoupling" but due to high volumes of traffic, the website was initially unavailable. The statement reads: "It is with hearts full of sadness that we have decided to separate." "We have been working hard for well over a year, some of it together, some of it separated, to see what might have been possible between us, and we have come to the conclusion that while we love each other very much, we will remain separate. "We are, however, and always will be a family, and in many ways we are closer than we have ever been. "We are parents first and foremost, to two incredibly wonderful children and we ask for their and our space and privacy to be respected at this difficult time. "We have always conducted our relationship privately, and we hope that as we consciously uncouple and coparent, we will be able to continue in the same manner." The couple, who married in 2003, have two children together, daughter Apple, nine, and son Moses, seven. Coldplay are used to performing in the largest venues around the world, but last night a small Somerset pub played host to the band. Coldplay world tour pushes them up Forbes most influential celebrity list but the top Brits are still only number 14. Coldplay have won best British live act at the Brit Awards. Coldplay have tweeted this picture ahead of tonight's 12-12-12 fundraiser for victims of Hurricane Sandy. 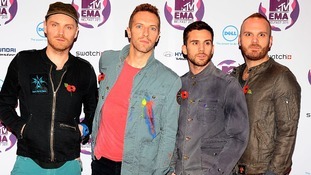 The band's front man Chris Martin is due to perform.